Some restaurants make me weep, but not with joy. At a place called the Palm in Newlyn, Cornwall, a plucky stab has been made at metropolitan cool; ambient music echoes across the pale wooden floor, sailcloth is boldly strung across the glass ceiling, the furniture is clumsily upholstered in white leatherette. There is something about the homespun puckers on the corner of each chair that brings a lump to the throat, but the rest of the decor quickly nixes any sentimental feelings. Hang those corny Cornish seascapes if you must, but please don't display copies of River Cafe and Nigel Slater cookbooks around your restaurant. Not if you want to inspire any kind of customer confidence, that is. Well, at least the butter is nice and I like the way the summer rain hammers on the roof, but, to be honest, not much else. Tonight's special is John Dory with lentils, pine nuts and a balsamic vinegar sauce; a sour and dubious dish made worse by the fish not being particularly fresh. Deplorable, really, given that the biggest wholesale fish market in all England is about 500 yards away. When was this fish delivered? "Not yesterday, but the day before," chirps the waitress. Well, lucky old me. Elsewhere there are crumby dry fish cakes, tough steak, bad vegetables and an affable chefy type swanning around his empty restaurant as if he was Cornwall's answer to Jamie Oliver. It is one year since the Palm opened and, judging by tonight's charred bullets, no one in the kitchen has learnt how to cook a potato yet. Not good at all. In my view. And speaking of views, let us hurry, hurry along to the Abbey Restaurant in neighbouring Penzance. 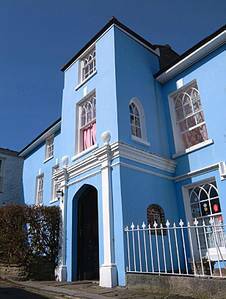 It is no longer a part of the Abbey Hotel next door, which is co-owned by the former model Jean Shrimpton, although the first-floor restaurant is forever boasting about its harbour views over the bay and towards mystical St Michael's Mount, oh yes, oh lovely. However, once you reach the shoebox-shaped room, it becomes obvious that only one window table has the lovely view and sitting at that table today is . . . Jean Shrimpton. It's like Lulu Guinness snapping up all the handbags in the Harrods sale. It's like taking tea at the Ritz and discovering the Barclay brothers have eaten all the cream cakes. It's . . . quite funny, actually. And I'd much rather look at Jean than any amount of bobbing yachts - not that you could glimpse a single mast through her wild, Roobarb frizz of grey hair. Has it gone all cloudy outside? No, its just Jean sitting in front of the window again. Now over 60, the Shrimp still has a scarecrow beauty all her own and is still as slender as a lily, with fine cheekbones, neat ankles and a pair of ritzy white pumps with black silk ribbons that lace up over her calves. There is a certain presence, a definite hauteur, and I notice the chef kneels when he comes over to speak to her. She bought the hotel more than 20 years ago and, together with her husband, Michael Cox, has turned it into a popular spot, with its own little dining-room. In 2000 they bought the nightclub next door - hotel guests were complaining about the noise - converted the premises into a proper restaurant and leased them to the chef Ben Tunnicliffe and his wife. The couple now own and run the restaurant independently, and wone a Michelin star in 2003. As much to the chef's surprise as anyone else's. "There's only two of us in the kitchen. I've got no time for that amuse de bouche carry-on," he says. In the Abbey's bar - a grotto-ish space painted scarlet - a live videocam of Tunnicliffe and his sous-chef plays throughout the evening; a study in calm and purposeful endeavour. "We like it best at the end of the night," says the waitress who brings glasses of delicious Camel Valley sparkling wine. "Because we love watching the boys do all the washing-up." The 30-seat restaurant is furnished in seaside neutrals - hessian, pale blues, glass tables, cane seats with cushions - and don't let the surprising lack of sea views put you off, it's very nice indeed. Tunnicliffe's menu is short, but brimming with honest toil, good sense and lovely things to eat. Each day, shimmering, savoury golden tarts are baked in the Abbey ovens, silky terrines are constructed, careful salads are prepared, proper consideration is given to meat dishes - liver with braised summer cabbage, mustard mash and beetroot; chargrilled fillet of beef with sweetbreads and fondant potato - and first-class seafood is expertly cooked and sent out with melodious accompaniments: snowy white plaice with pancetta and sweet broad beans; juicy, golden turbot nudging against a nest of tagliatelle dressed with fresh crab, spring onions and a sprinkle of purple basil. In short, he's fantastic, from the bottom of the crisp pastry on his heavenly crab and tomato quiche to the milky velvet depths of his chocolate and almond mousse. I love the summer simplicity of scallops just toastily seared and served with a salsa cruda and peppery rocket, and the care that goes into preparing a home-made lemon and chive mayonnaise. Everything is done brilliantly well, from the split-second timing of the fish to the cool, cucumber chutney served with a richly flavoured smoked haddock souffle. And how incredibly refreshing to find a talented chef who is prepared to buy the best, let it speak for itself where necessary, and put together a simple, but skilful modern menu aimed at pleasing the crowds and giving value for money, instead of gratifying the kitchen worthies and generally showing off. Great stuff. Unsurprisingly, the modest Tunnicliffe has been inundated with job offers since his Michelin award, but says that he is happy cooking here, with the "best produce in Britain" on his doorstep. If you do book, be careful to stipulate that you want to dine at the Abbey Restaurant, not the restaurant in the Abbey Hotel. Previously, the staff have not been as diligent as they might in making clear the difference, leading to some confusion and disappointment over bookings. Basically, you want to be wherever Ben is cooking, in a room with a view or not. Postscript: The Palm in Newlyn has now closed. he Abbey Restaurant, Abbey Slip, Penzance, Cornwall (01736 330680). Set lunch menu, £25 for three courses (the restaurant opens for lunch on Friday and Saturday only). Set dinner menu, £25 for three courses until 7.30pm. A la cart menu, around £35 per head, excluding drinks and service.